This's not new to post. 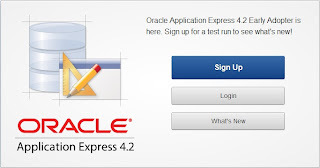 I read Application Express 4.2 Early Adopter 1 available on Joel Kallman's blog since June 21th. But It was my birthday. I just Signed Up and didn't learn & post anything. A lot of features, that you can learn. 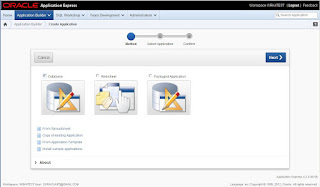 On Application Builder, You will see Packaged Applications (A set of business productivity applications, easily installed into your workspace or Database Cloud service. Also includes a set of sample applications which demonstrate specific capabilities of Application Express), They are free (they will be supported by Oracle). If you want to modify a packaged applications. You can unlock the application, but it's no longer supported by Oracle and can no longer be updated. OK... came back. I just wanted to create once application! Below picture, You will see new page template for "Create Application" steps. After finished. You see... Lock column. That mean You can lock each page(Locking a page will ensure no other developer will change the definition of a page you lock). ok ok ...I just wanted to post about APEX 4.2 available and showed something a little bit. If you have time, don't miss to sign up, test and share.